The Ngozi Family formed in 1975 in Lusaka, Zambia, and shot to stardom. Bandleader Paul Dobson Nyirongo aka Paul Ngozi enlisted former members of his previous band, The Three Years, and gave a popular voice to what later was called “Zamrock,” a cool fusion of older African rhythms and ’70s rockish underground modes — never too polished, but with a tightness that would have made groups up in London take notice. 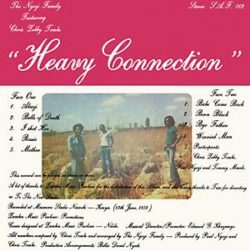 Heavy Connection, recorded in 1978 with drummer Chrissy Zebby Tembo, features razor-sharp guitars, hard rhythms, and a mix of English and Zambian lyrics. Original copies are impossible to find. RIYL: Witch and Amanaz. Fuzz guitars all over with African beats and political lyrics. 180-gram black vinyl. Heavy sleeve. Includes two-page insert. Numbered edition of 500.